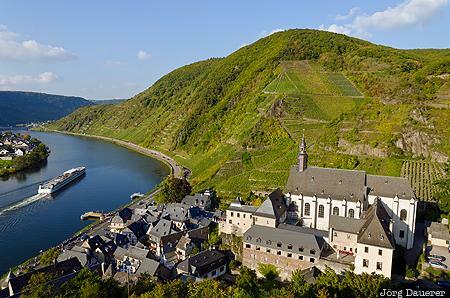 The small village Beilstein surrounded by vineyards at the banks of the river Moselle (Mosel) illuminated by warm evening light with a lone ship on the river. Beilstein is in Rhineland-Palatinate (Rheinland-Pfalz) in the western part of Germany. This photo was taken in the evening of a sunny day in October of 2014. This photo was taken with a digital camera.